Drago Centro’s new bar guy Kyle Ackley. Leave it to the bartender shuffle to make you fall in love with a mixologist and their cocktails at your new favorite bar, just to have them disappear on you. Well, Jaymee Mandeville, the creator of cocktail favorites like the Night and the City and the American Cherub, has left Drago Centro for the bright lights of Bacardi and Kyle Ackley has taken her place. You might be familiar with his work. 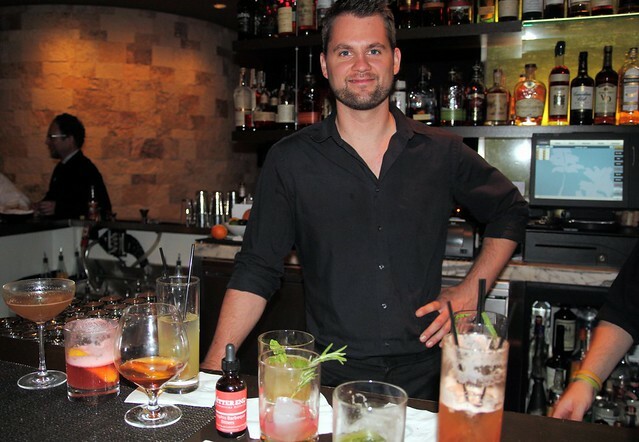 He was the beverage director at Lexington Social House, was awarded Zagat’s “30 Under 30” in 2012 and did the entire opening beverage program at Bungalow Santa Monica. Now he’s in charge of the cocktails at Drago (here’s the menu). 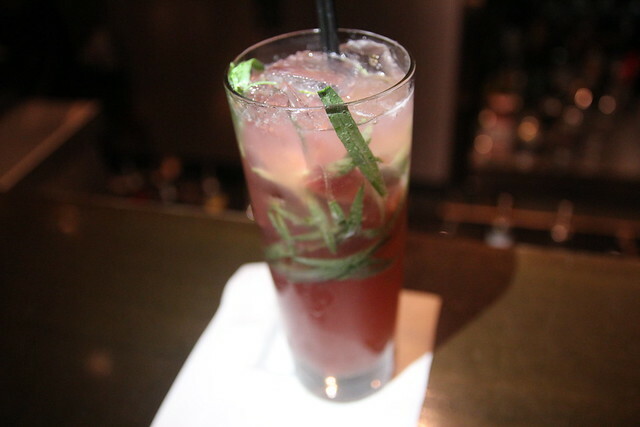 I have to admit that I was skeptical of his work at first because he had done the cocktails at scene-y places like SBE properties and XIV by Michael Mina, which tend to be too sweet and of the flavored vodka variation. But earlier this week, I had a chance to check out Kyle’s creations at a hosted tasting and was pleasantly surprised. No sticky, sweet concoctions here. 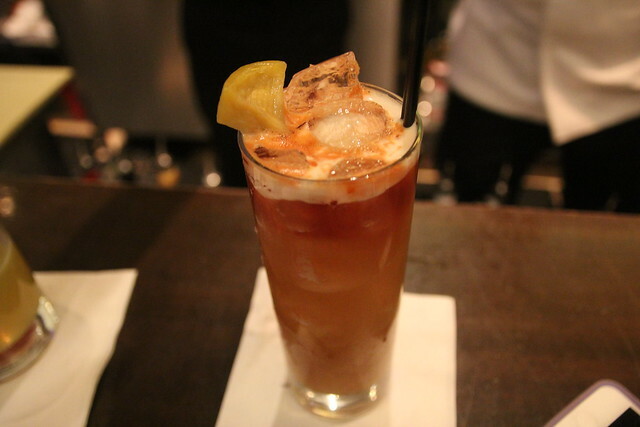 In fact, all the cocktails have the food in mind as Kyle created the drinks to work well with the dining, especially in helping to cut the heaviness of an Italian dish. But he also wanted these to be something of substance that you have on a hot day. Check them out, along with my random notes. 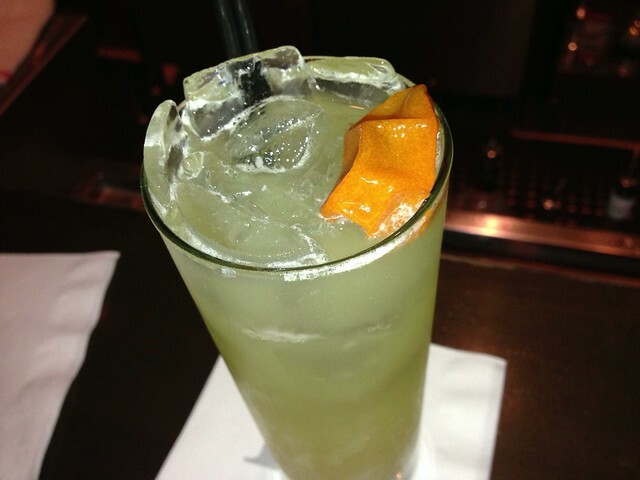 Bella Bionda (“Beautiful Blonde”): This cocktail was created because the Italian restaurant really wanted one made with grappa. Tasty, flavorful. Refreshing, goes down quickly. Even though it’s a cocktail with ice, I like it. Not watery or overly syrupy. Well balanced. Not boozy though. One of my favorites off the menu. I kept going back to it. Vibrante: Made in the style of a Scot Beattie cocktail, Cyrus. Tart and sweet, almost vinegary like a shrub thanks to the pickled grape skins. Would be a good aperitif cocktail. Gets you salivating. But also polarizing, not a mainstream cocktail. All Dolled Up: Bitter and boozy, not a girly drink but at all. However, it is the only cocktail made with vodka. Vodka heats it up. Pepperyness goes well with Campari and grapefruit. 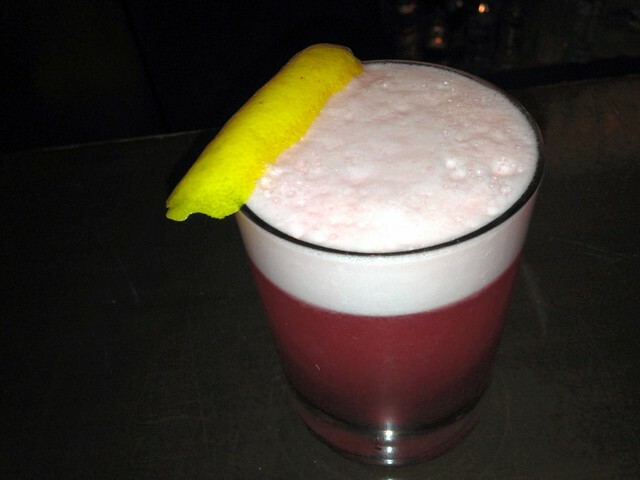 Stars in this are the Campari and the vanila rhubarb shrub. Bitter and sweetness isn’t up front. 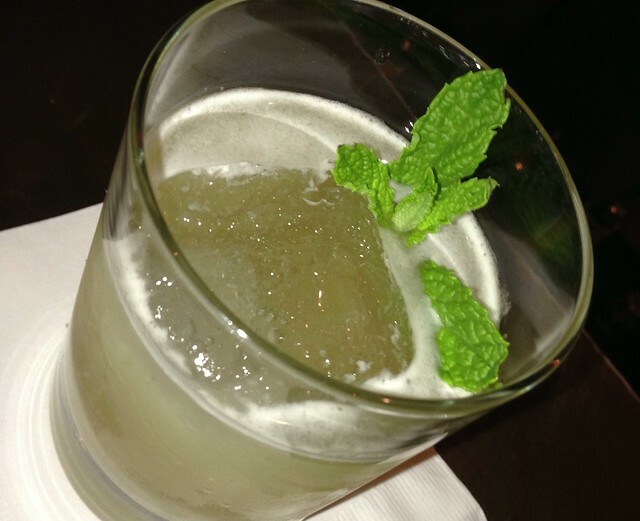 Merchant: Kyle’s take on a tiki drink. Pilsner dries out the cocktail and adds an herbaceousness, it’s refreshing. But I also found it a bit soy sauce-y and bitter. Scotsman is a Scotch smash. Really simple concept and flavors. It’s OK. Not outstanding. For the person that doesn’t want something frou-ey but at the same time it’s more of a happy hour cocktail. Would want something more for my money honestly. Nicolina: The float is Cabernet (Il Bruciato 2010) dries up the cocktail and gives it a lot of body and sweetness. This is an interactive cocktail where the less dry you want the cocktail, the more you stir the Cabernet float into the cocktail with the rosemary. I really like this one. It’s surprisingly vanilla-y even though that’s not an ingredient. Jammy. Fun, interactive cocktail but so tasty and approachable. Satisfying. 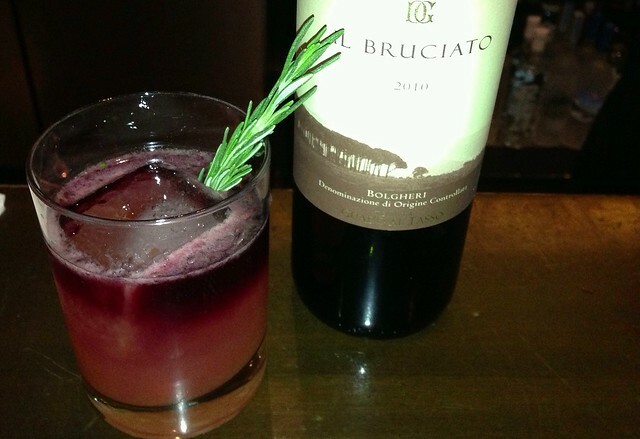 Il Cocciuto: Managing partner Matteo Ferdinandi says this cocktail reminds him of an Italian popsicle and to that I say, what kind of popsicles did they give kids in Italy? This is very spicy, hot. Not as bitter as it sounds. Heavy dose of ginger. And I surprisingly liked that pickled artichoke. Surprising because I usually dislike pickled anything. 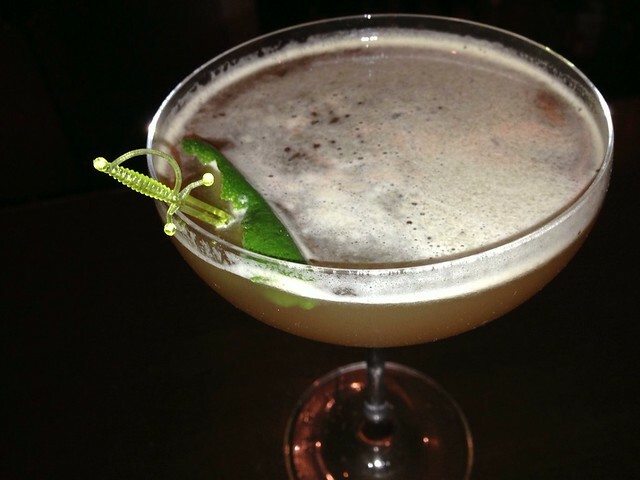 The Diplomat: Kyle said he got the idea for this cocktail from a salad — fennel, apple, lemon and balsamic. Another interactive cocktail of sorts. Here you let it sit for a few minutes, the fennel cube (1 part fennel extract and 1 part water) will melt. Obviously it adds to the cocktail in a subtle way. Take a couple of sips right away, you’re still going to get the fennel on the nose and you get to have the cocktail other than the fennel off the bat. Leave the cocktail for 10 to 15 minutes when the ice cube starts to half melt. It’s really light, refreshing and completely different. Another new favorite. Old Flame: “She loves to smoke, she can be sweet at times and she’s really strong. Sometimes too strong,” said Kyle of this cocktail. 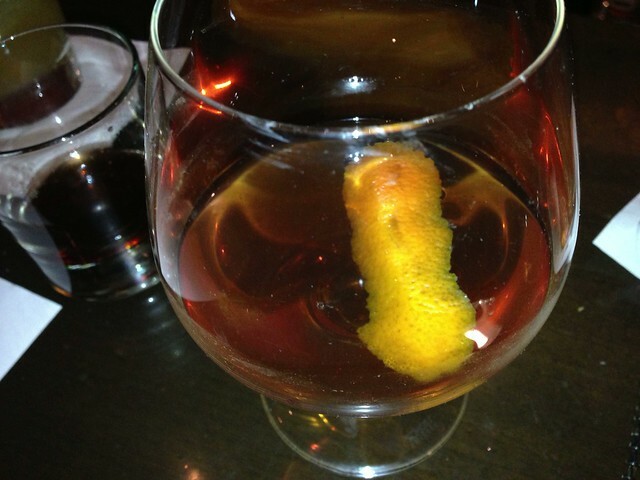 He created this one in the style of a Sazerac. Take a chilled snifter, express lemon peel in glass and discard. He made a wood syrup with demerara sugar with mesquite wood chips and in the cocktail it sneaks up on you and then finishes with the hint of tree bark. It smells medicinal. But the smokiness complements the mezcal instead of dumbing it down. The Memphis BBQ bitters gives it the spice that goes up your nose and sets your mouth on fyah. 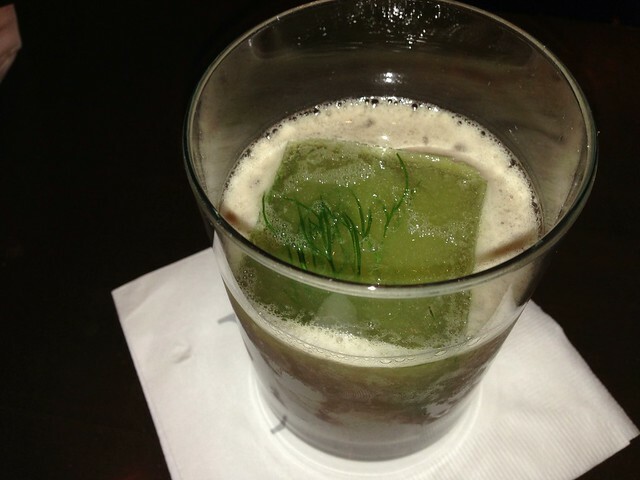 This isn’t a cocktail for the faint of heart. It’s strong. Solid. Have a cigar with this on the patio, after your meal.